Discussion in 'Kontakt' started by Adam R. K., Sep 24, 2018. My name is Adam and i'm having problems with one certain library on cracked, unlocked kontakt 5.5.2.880. I downloaded library called "Action Strings" from here (second attempt - downloaded several days ago): torrent2 , and from here previously (first attempt - downloaded several years ago)): torrent1 . Before i did this i downloaded and successfully installed cracked kontakt 5.5.2.880. All cracked libs work (like symphobia, evo mandolin etc. ), but this library (Action Strings) does not want to install, and this is to be honest something i desperately need to use (just learning purposes - not commercial ofcourse - as i live in poor country and wouldnt be able to afford to even buy the damn kontakt). Previously before windows 10 fresh reinstallation i had kontakt installed (i dont recall which version was it unfortunately) and the "first attempt" Action Strings download worked perfectly. But now as i updated to windows 10 v1803 (updated from windows 7 home premium), the only library not working is the Action Strings. And how is it not working? Well after i add the library by using "add library" button and after attempting to load the instrument i get "Your new library needs to be added before this instrument can be used. Please go to Kontakt's libraries tab and press the Add Library button." Now - at first i thaught there might be something wrong with my old library files (including the nicnt file). But after redownloading the same library from different torrent i get the same error. I tried to remove "Action Strings" registry entries in the registry but it didn't help. Tried installing several different cracked, unlocked kontakts but every single time i got this exact error. Please if any of you has an idea of how to help me - explain like to a 10 year old - i am completely new to this musical software stuff, im just a simple violinist (im not into IT technologies and how musical programs work). PS: If you want me to send over the .nicnt file let me know. I will try out some google drives as this page does not accept attachments in .rar nor .nicnt format. Does the SNPID line located in: C:\Program Files\Common Files\Native Instruments\Service Center\Action Strings.xml match the "Action Strings.nicnt" SNPID? From your image they should both be "<SNPID>454</SNPID>". Just open both the .xml and .nicnt files side by side using notepad and compare the "<SNPID></SNPID>" lines. Get kontakt 5.8.0 first off from the sister site get installed then get back to us if it's still not working. I seem to recall that with Action Strings, even though it loads through Kontakt, you still have to run the actual Native Instruments Installer for it to actually work inside Kontakt i.e. you couldn't simply point to the NICNT data path using the 'add library' method... have you checked for a setup type file in the torrent? I just checked and it definitely comes with it's own custom installer. It does have that but if you have just the lib it works fine my action strings lib sits on an external harddrive never installed thru the NI installer just add the path. My wild guess is that he has another library with home-made nicnt that used the same SNPID number to register/add the library. Now, on mac we have a script to list all of the SNPID number from added .xml files. In Windows I don't know similar tricks, you have to check the other .xml files if there is the same SNPID number for other library. If so, you should change this code in that other library's .nicnt and .xml files, and not the code of Action Strings. Those libraries that come with original .nicnt, should not change. My other suggestion is to try Kontakt Portable, but first only with that library added. @Nana Banana Thank you for help dear Mr. it helped. Action Strings snipd numbers were not matching! @robbieeparker14 I head free version of kontakt from their official site will only work in demo mode for 15 minutes with each library. Is that true? I'vebeen only trying out cracked ones till now thats why im asking. @Paul Pi thank you for usefull info! PPS: Moderators - I suggest pinning this thread for sake of other people. Your welcome. That's usually the first problem to check. I'm glad it worked! Hello there, it's me again. 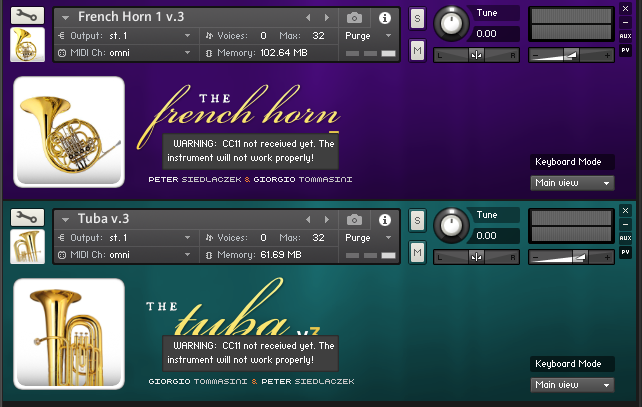 This time i'm having problems with Sample Modeling French Horn and Tuba sample library. The weird thing is - i double checked the SNIPD's in the .nicnt of the default file AND in the C:\Program Files\Common Files\Native Instruments\Service Center\ <--- there is no xml's for any sample modeling libraries. I have already trumpet and trombone and those are working indeed. But French Horn and tuba doesn't want to, after i try to add it via "add library" it shows that library has been added successfully. After reopening Kontakt i cannot see the library on the list and i cannot open any of its nki files manually. Cracked Kontakt 5.6.8. Also i checked SNIPD's in the NativeAccess.xml file in ServiceCenter folder and the snipd AND regkeys match the library nicnt perfectly. I have no idea what the issue might be. Hi Adam. Stand by, I am downloading the French Horn & Tuba 3 library at the moment to check this out. Although I'm using 5.8.0, which shouldn't matter. the snipd AND regkeys match the library nicnt perfectly. I have no idea what the issue might be. Oh so ok, you did check that. Sorry, I went off on my own tangent. I'm going to experiment with the XML method. In the meantime, I suggest that you delete all the regkey entries for this library and start again to see if that works also. Miraculously, it worked BUT. Beware users - if you are using symlink cracked Kontakt (there is a torrent searcher called tparser(wont add the end cuz adding full links is prohibited, you ll find it on google), and you can download it there its called kontakt 5.6.8 symlink. The no-install version requires just running an installer which just integrates the files into your system. But after you do this i recommend moving all the atached files you got there into your program files folder because otherwise you can have issues. Thank you for sharing that Adam. That's very interesting, as I have never used Native Access before, and had no idea that the SC was condensed like that! Just glad you finally got it working, and taught me something new in the process!